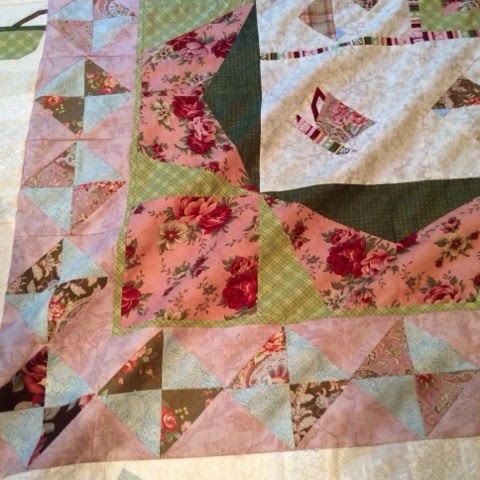 This week I finished my first Quilting Round Robin. Last November my Mom and a group of quilting friends needed another person to fill out their Round Robin, which was part of 3 other groups of 6. 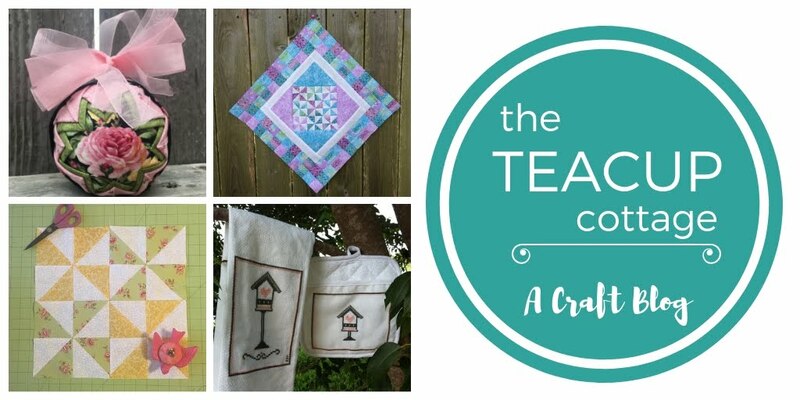 Since we started a meeting behind and one person short, we needed to attend our first meeting, their second meeting, with our medallion block and one border. 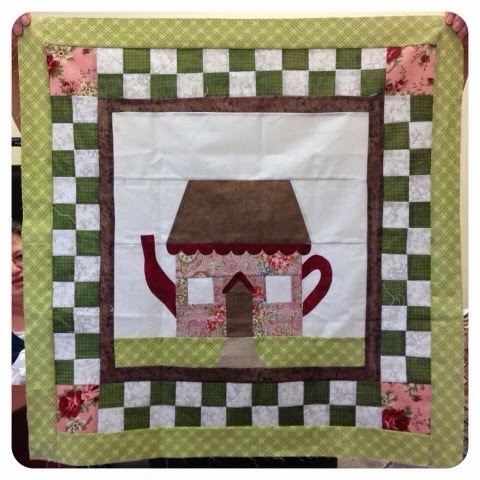 This was my medallion, is Sweet Tea Cottage Block of the Sweetheart Cottages in the Follow Your Heart Pattern by The Quilt Company. 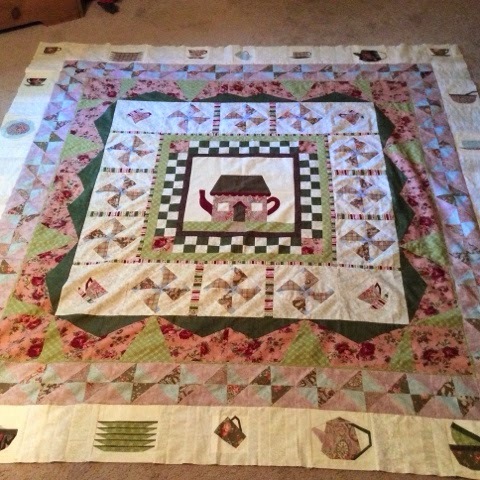 It was the first pieced quilt block that I'd ever done. It was not as hard as I thought it would be and look forward to trying other patterns in the future. 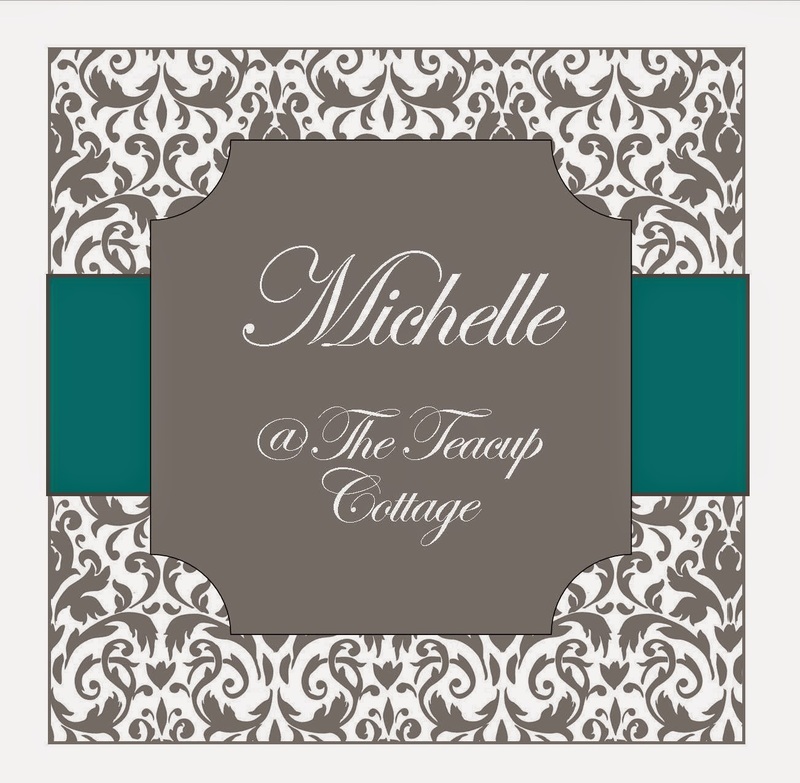 After completing the medallion or center, I added a checker board style border and solid to bring out more of the green accents in the medallion. The Shabby Chic look and soft pinks and greens are something that I have always loved though it was not the dream my Prince Charming had in mind for a home when we got married, so I never really decorated the home in that theme. 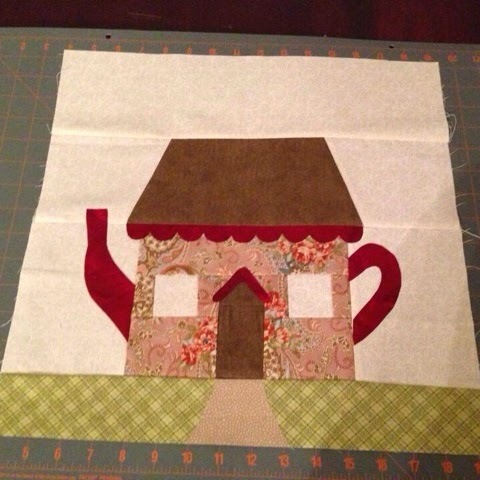 But when I saw the Sweet Tea Cottage Block, I know it had to be the centerpiece of my quilt. As far as my first Round Robin experience, I would have to say it was very intimidating. 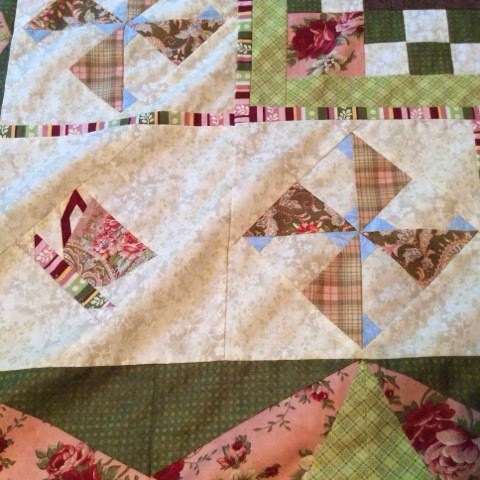 I am a novice quilter - at best - mostly making large repeating blocks quilts at this point. I have been exploring with Quiltsmart's printed interfacing, but I have very little confidence in my own skills. My lack of confidence was a big hindrance despite the support and encouragement of the other quilts in my team and the others in the group. I still felt like I would be the person to mess up these beautiful quilts for everyone else and it soon the self-imposed stress prevented me from having fun. I learned a lot from the other participants and really enjoyed the experience, but after some thought I decided that if I decided to continue in the Round Robin,I would do a Solo Robin. 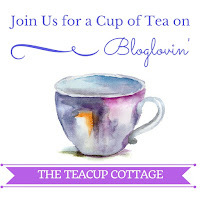 That just means each meeting I will work on a quilt and add a border, it will just be the same quilt - mine. That way if I ruin it, or waste fabric trying to do something new, or any of the other worries I had, it will be at a cost to me, not another quilter. 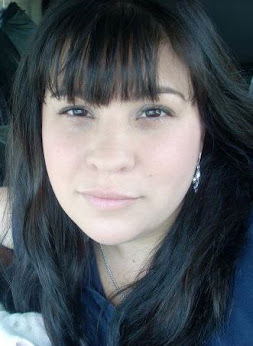 In fact after sometime, I decided I would try it again, get back on the horse, sort of thing. So this year it will be the Quiltsmart Princess Feather I wrote about in my last post. But regardless, last night was amazing. My mom arrived with the quilt pretty late. Iwas unable to attend the big reveal party because it was a 4-day retreat and my husband had law school finals. We had just come back from an Astros (MLB) baseball game and was trying to get the 4-year-old to settle down after copious amounts of junk food and sugary treats from the ballgame. 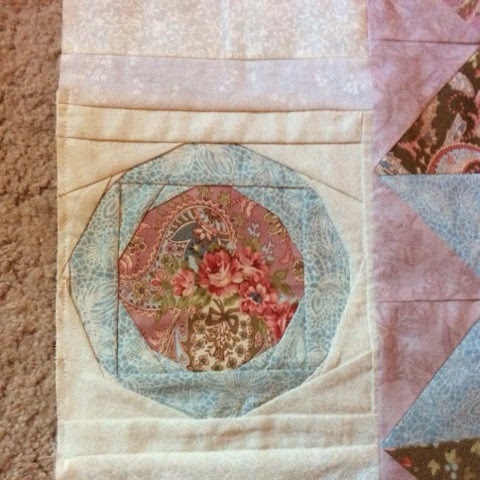 I will probably add a solid border to finish it off, and then hopefully get it quilted. I really was happy to hear the other quilters enjoyed their quilts. Now that the stress is over, I think I might enjoy this Solo Robin that we are starting soon. 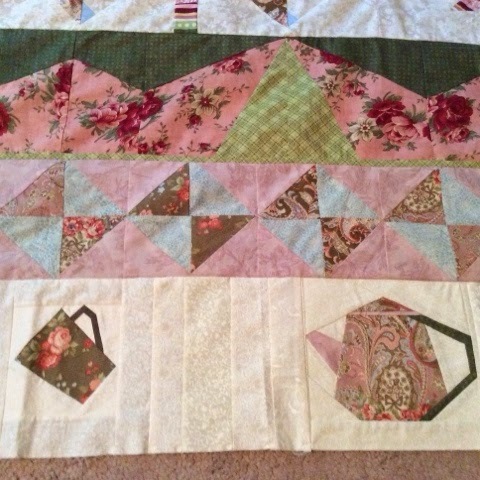 This quilt definitely has me feeling #CreativelyInspired!